December 2015 – This is a blog. I write it. Food is denial. Food is pleasure. Food is honest. Food is sinful. Food is expression. There are many ways we label what we eat and would like to eat. So closely connected with bodily functions, it has been rejected, upbraided and worshipped. So presenting, a collection of films that excite the sensory organs – Films on Food. Food is the near-perfect beginning to a New Year. The films are placed in the order of release, with the oldest first. It is the reader’s decision as to what makes their list and what doesn’t. The table has been set, please enjoy your meal! Gabriel Axel’s adaptation of Karen Blixen’s short story Babette’s Feast has fable-like qualities. Set in a desolate landscape, the Jutland Coast, it narrates the story of two elderly sisters Martine (Brigitte Federspiel) and Philippa (Bodil Kerr), the daughters of the deceased puritan pastor of the village. The story delves into their past to explain how they came to employ a French housekeeper Babette (Stephane Audran). The story comes a full circle with Babette’s celebratory feast in honour of the birth anniversary of the pastor. The feast juxtaposes a fine food connoisseur against the simple folk of the pastor’s austere sect, who believe extravagant food is sinful. There is displayed in the film, paternal selfishness and a loss of the original idea of what the religion was to stand for but the beauty of the film is that it does not condemn but accepts. The meat preparations may seem unpalatable to vegetarians but there is so much more to it than just that. Pope Francis has claimed this to be his favourite film. Set in a quiet French town that believes in tranquillity especially during the season of lent, the film follows Vianne (Juliette Binoche) and Anouk (Victoire Thivisol), who like the wily north wind blow surprising changes into the lives of the townspeople. The film is rather obviously about chocolate but also living life as opposed to seeing the time on earth as only a preparation for the heavenly abode. Life is not for flagellation alone but pleasure as well. The film sells the idea that chocolate could be the answer to every ailment and the viewer willingly buys it because it is so exquisitely presented. 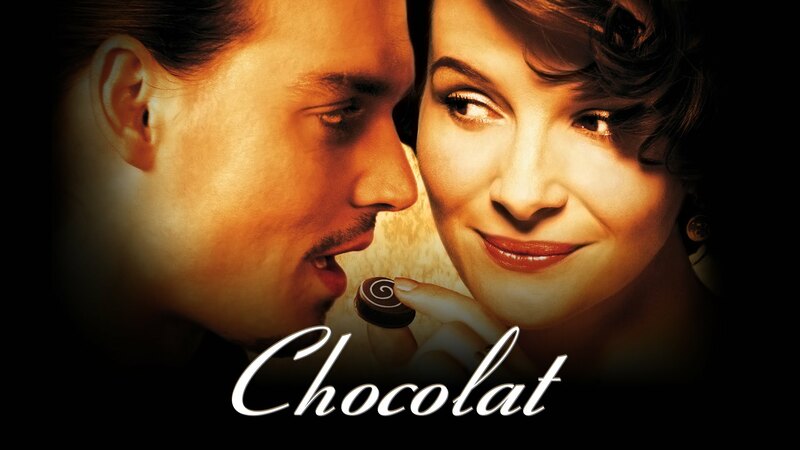 For more, read my full review of Chocolat. Most would catalogue this movie into films on Travel. 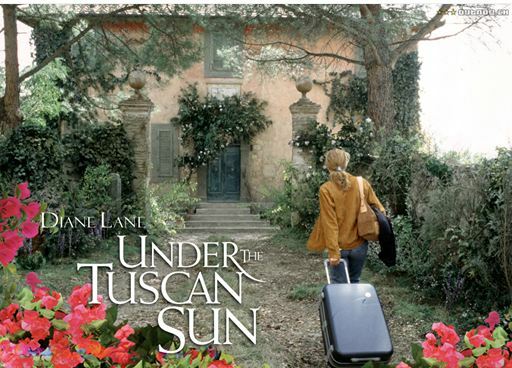 While it is true that it is about travelling to Tuscany, it is also a film about self-discovery. Frances Mayes (Diane Lane), a writer and book critic, goes through a painful divorce, battling insecurity and lack of self-worth. A gift by her friends sees her on a trip to Tuscany. There, she makes the impulsive decision of buying an Old Italian villa because she feels it’s a sign. In the process of restoring the villa, she begins to heal and more importantly, build valuable relationships, with the workers, her neighbours, potential love interests and Katherine (Lindsay Duncan), the enigmatic English female actor who doles out advice by the Great Fellini and vociferously defends vanilla ice cream’s power ‘to change fate’. Traditional Italian families still believe in the sit down dinner because as Placido (Roberto Nobile) points out “it is unhealthy to eat alone.” Sharing a meal and having someone to cook for is the warmest idea of community. Remy (Patton Oswalt) is a rat who has a wonderful sense of smell and the creative mind for cooking. Of course, the chances of a rat being allowed to cook in a restaurant are next to impossible, which is why a chance relationship with Alfredo Linguini (Lou Romano) the garbage boy, results in a partnership that lets each have what they want. Throw in a couple of short-sighted avaricious villains, a frightening sallow-faced food critic Anton Ego, voiced by Peter O’Toole and – Bon appétit! The signature line of the film, in Chef Gusteau’s words – Anyone can cook! No Reservations is about two chefs who end up working in the same kitchen to interesting results. Kate Armstrong (Catherine Zeta-Jones) is a fastidious head chef of a popular restaurant. The untimely death of her sister makes her the guardian of her nine-year old niece Zoe (Abigail Breslin). From being someone who doesn’t allow people and relationships to interfere with her work she now has to deal very closely with grief and more importantly, her niece’s grief. Added to that disturbing state of affairs, is the entry of the new sous-chef her boss Paula (Patricia Clarkson) hires. Nicholas Palmer (Aaron Eckhart) is a carefree chef who is popular in his own right but wishes to work under Kate and hence joins the restaurant. Kate is suspicious of his motives but slowly begins to warm to him. The rest of the film follows the characters as they journey towards a sense of completeness. While not particularly moving, the obsessive love for cooking displayed by Kate is awe-inspiring. Especially her early morning visits to get the best ingredients for her dishes, making it a point to choose them herself. Julie and Julia is based on two true stories – that of Julia Child and the other of Julie Powell. They have both moved to a different place because of their husbands work. While Julia (Meryl Streep) happens to love France, Julie (Amy Adams) hates her new home. Both women find themselves in a rut professionally, and use food to find themselves – one as a cook and the other as a writer. What is really beautiful about the film is that Julia Child’s journey which took place post World war helps Julie Powell find herself as she decides to make all of Child’s recipes and blog about it. The relationships of the characters with each other even through space and time and most certainly with food, defines the film. Stanley ka Dabba is a children’s film with heart. It says so much but does so without being preachy. A sense of nostalgia coupled with a vague sense of unease accompanies the viewer as they follow Stanley’s story. The film opens with Stanley (Partho Gupte) coming rather early to school with marks that look suspiciously like bruises. However, Stanley is a storyteller who can spin a yarn about just anything and that makes him well-loved. He doesn’t carry a dabba (tiffin) to school so one begins to suspect the state of affairs at home. One poignant scene shows him filling his stomach with water because he has no food. There is also a teacher Babubhai Verma (Amole Gupte) nicknamed Kadoos (grumpy) who also does not carry a dabba but eats from others. He steals from the tiffins of his colleagues or else bullies students into sharing their food. His mannerisms are disturbingly that of a child abuser and within the narrative an important metaphor. Food is central to the film but it is about the simple meal a child would carry to school in a dabba. It states the value of a home cooked meal. The title of the film is a pun on food and age. It follows Kalidasan (Lal), a middle-aged archaeologist who is a food connoisseur. His closest relationship besides his work and food is with his cook Babu (Baburaj). Even his nephew Manu Raghav (Asif Ali) loses precedence in front of these. A missed call by Maya (Shweta Menon), a dubbing artiste, leads to a misunderstanding between Kalidasan and her. Eventually, their shared love for food becomes the foundation stone for a telephone friendship. The conversations follow the histories of various dishes especially Joan’s Rainbow cake. Their own romance and that of the secondary couple display classic elements of Shakespearean drama. The fact that love has no age makes this film comfort food. Ustad Hotel is Faizi’s story. The beauty is, Faizi’s (Dulquer Salman) story starts long before he was born. His one defining memory is shown to be, his grandfather Kareem ikka (Thilakan) feeding baby Faizi sweet milk. Food in all its forms makes up this movie. Be it the conversations on love and philosophy over a cup of sulemani chai between Kareem ikka and Faizi, or that being a good cook is about satisfying the heart. Conversely, there is a stigma attached to becoming a chef in the rich orthodox Muslim community. Chef = the guy who makes biryani at a feast. Hence, it’s not an honourable profession. It makes Faizi a poor match for Shahana (Nitya Menen). The film is then about changing stereotypes and fixed notions of what your destiny is. The film with its evocative camera work and vivid dialogues brings forward a mouth-watering array of Calicut cuisine. Originally planned as a documentary on the Dabbawalas of Mumbai, it developed into a love story between a cantankerous office worker and a house wife. Saajan Fernandes (Irrfan Khan) is due for retirement and has shut himself post the death of his wife. Ila (Nimrat Kaur) is trying to regain her husband’s interest in her by making delicious lunches for him. However, the lunchbox, in a one in a million chance gets wrongly delivered to Saajan. On realising her mistake, Ila writes a note explaining herself and that starts off an exchange of experiences through notes, accompanied with delicious lunch. The film does a lot of things differently. It shows a connection being drawn through the old fashioned means of writing a letter. It is a portrayal of loneliness and the need for validation from another human being. A head chef Carl Caspar (Jon Favreau) in a fine dining restaurant drags his reputation through the dirt after engaging in an online slingfest with a popular food critic who pans his cooking. Post his rather public meltdown, he walks away from the restaurant and finally agrees to his ex-wife Inez’s (Sofia Vergara) decision to start a food truck. The road trip that he sets on is as much about finding his creative centre as it is about mending his dented relationship with his son Percy (Emjay Anthony). The film abounds in clichés but certain things set it apart, for instance his relationship with his ex-wife who is still very supportive. The surprise element like the legendary chemical X is Robert Downey Jr. who plays Marvin, Inez’s ex-husband. He literally lights up the screen. And yes, the food. If it was humanly possible to put your hand through the screen and grab a cubano you would do it. It is your junk food fantasy film. This is by no means a comprehensive list. If you have any suggestions for Films on Food, mention it in the comments box below and I shall get to it at the earliest! 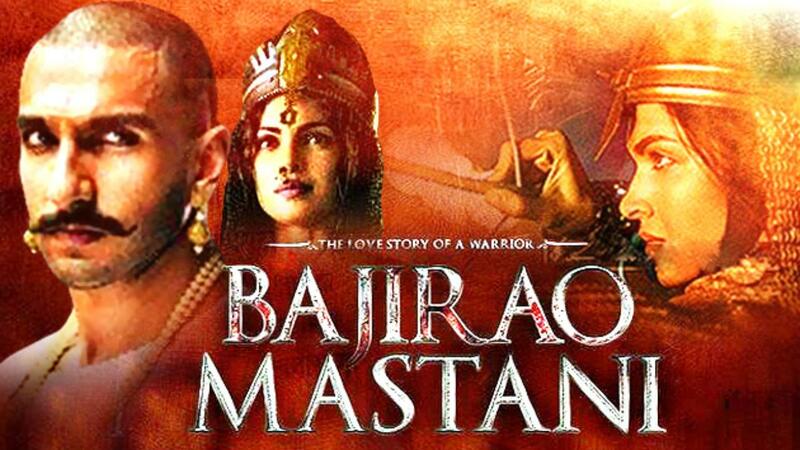 Bhansali’s Bajirao Mastani is a true love story of epic dimensions brought out from the shadows to which history has confined it to appease powerful yet blinkered mindsets. Bajirao (Ranveer Singh) is a young warrior of an illustrious lineage who is elected to the office of Peshwa in the Maratha Empire despite his youth, because of his breadth of vision and intelligence. Willing to take risks and making impulsive decisions, he embarks on several successful military campaigns. While not accompanied by his wife Kashibai (Priyanka Chopra), her devotion to him is his strength. It is the impulsive campaign to Bundelkhand that brings Bajirao face to face with Mastani (Deepika Padukone), a princess of Bundelkhand. He falls in love with her but realises that a union between them is unlikely so he returns, pushing away thoughts of her. Mastani, however, takes a particular act of his as a sign and follows him to Pune. It is here that all the subterfuge against this unacceptable union begins. It is helmed by Bajirao’s mother Radhabai (Tanvi Azmi) and her son Chimaji Apa (Vaibbhav Tatwawdi). It is almost frightening to witness how fanatical people can be about ritual purity, religion and the ilk. It is ironical too because the people oppose the Mughal Empire and Muslims but use Urdu-influenced Hindi in official and personal contexts. A significant line in this context is by Bajirao when he said (it’s not a verbatim quote) that yes he fights against the Mughal Empire because he is against them and what they do, not their religion. This is a telling statement in the current socio-political situation as people get blindsided by belief systems that have almost hypnotic qualities. The film is thus subtly critical of the times. However, what was a letdown is that film focuses on the interior intrigues of Shaniwar Wada (Peshwa’s house) as opposed to the Maratha Empire. The character of the Pratinidhi (Aditya Pancholi) thus becomes a little underused because there were many political intrigues that involved the Peshwa and him in opposing factions. Strangely enough, for a movie titled Bajirao Mastani, Mastani seems to be in the shadows and Kashibai is much more prominent. The filmmaker is sympathetic to Kashibai’s plight because she is the simple-hearted woman who finds her faith in Bajirao shattered by the entry of another woman. She believed that he could never do anything wrong and was a moral, upright man. One of the opening sequences, show her in conversation with her friend whose husband was executed by Bajirao for spying against him. It is Kashibai’s vehement refusal to accept any slight against her husband that makes the scene poignant. It is then fitting, that a woman like Mastani, whose story has frequently been the focus of erasure or sidelining by forces then and now, should still be cloaked in mystery. Bajirao-Mastani’s love story is affecting because even if the orthodox society of his times chose to see her as his mistress, he saw her as his lawfully wedded wife and did everything to give her and their son, equal rights. Their love story in the film hasn’t been given much time to develop, say unlike the romance in Hum Dil De Chuke Sanam. This could be a bit of disappointment but then again, it is a film for the 21st century audience. Interestingly, the film posters give the first clues about the portrayals in the film – the left side of any image is seen as less eye-catching because generally humans see the right side as more dominant. So it is appropriate then that Kashibai is to the left of the viewer, however, her image is more forward-positioned. Mastani is appropriately to the right, yet her image is withdrawn from the viewer’s gaze. Bajirao’s is a centred image, very squarely placed – like someone whose position in history cannot be shaken. Bajirao’s relationship with Kashibai is eloquently played out by the actors. Their marriage is based on friendly camaraderie and shared confidences. Nevertheless, their intimacy plays out in a rather traditional manner with Kashibai being the recipient of her husband’s desire. On the other hand, Mastani, probably because of her experiences as a warrior, is more straightforward about her feelings and passionate in her expression. The film performance-wise and casting-wise is impeccable. The casting of Milind Soman as Pant was a refreshing change and his interactions with Bajirao have a drawing power to them. Even the interactions between Radhabai and Kashibai are noteworthy and reveal the extent of their filial devotion. All the characters hold their own in the narrative. And it is Ranveer Singh’s finest performance to date. He is Peshwa Bajirao in every frame, though the song Malhari is a little discomfiting. It is a great listen but if he was Bajirao in every frame, in this song he was more of a controlled Ranveer Singh. Pinga however, is actually brilliant, so pay close attention to the lyrics. A film made for modern audiences; it may seem slightly fast-paced in terms of narrative but still possesses a well-meshed screenplay and flawless camera-work with all the grandeur of a Bhansali film.